Whether in a glass of wine, cold beer or stirred up in a cocktail – alcohol is part of our social culture. However, excessive drinking can increase risk for over 60 chronic or acute conditions. Canada’s Low-Risk Alcohol Drinking Guidelines provide guidance for a more moderate approach to alcohol that takes long-term health risks into account. 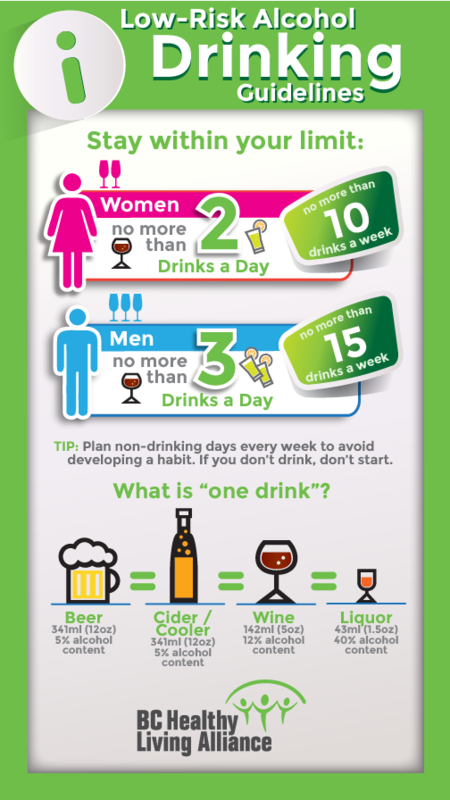 For women this is 1-2 standard drinks per day but less than 10 in a week, and for men it’s no more than 3 drinks per day and less than 15 in a week. Alcohol is ranked as the #2 risk factor for chronic disease, right after tobacco by the World Health Organization (WHO). And it’s not just ‘problem drinkers’ that are at risk. The amount of alcohol needed to impact on chronic diseases, such as breast cancer, gastrointestinal disease and cardiovascular disease are much lower than ‘problem drinking’ levels. The International Agency for Research on Cancer (IARC) includes alcohol as a ‘Group One Carcinogen’, the highest rating for cancer causing substances. World Cancer Research Fund found that alcohol caused cancers of the mouth, pharynx, larynx, oesophagus, colorectum (in men) and breast. As BC decreases the use of tobacco through effective health promotion policies, alcohol’s potential burden on chronic disease is projected to become equal or greater than tobacco’s. Policy approaches that support a moderate alcohol culture put reasonable restrictions on access (through location, hours of availability and pricing). This is important because evidence has shown that access and pricing are the key factors that mitigate or contribute to drinking rates. Maintaining the moratorium on private liquor stores past 2022. Reducing demand through pricing. The cost of alcohol and increases in prices has been shown to reduce demand effectively, particularly among youth. Developing coordinated communications to promote Canada’s Low-Risk Alcohol Drinking Guidelines and ensure continued dissemination, particularly to youth. “OPA!” Will BC’s Liquor Policy Review Inspire Mediterranean Attitudes?